Burnley made it eight Premier League games without defeat by beating Spurs 2-1 at Turf Moor. 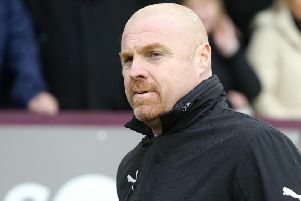 But Clarets boss Sean Dyche admits it would have been a bitter blow had they not beaten the title hopefuls, after a controversial equaliser from England skipper Harry Kane. Chris Wood and Ashley Barnes continued their superb partnership with goals either side of the returning Kane's leveller, which came when Danny Rose collected the ball from the fourth official Craig Pawson and took the throw yards further forward from where it went out. He then used the extra distance to send Kane clear to finish, and Dyche mused: "I'm bound to be aggrieved by it, at the end of the day, it goes out, a mixture of things - I don't think the fourth official wanted to be part of it, but actually catches it and plays it back to their man, that allows him to play quickly and that's one of those things. "But it allows him to play quickly eight yards further down the pitch, and that leads to a goal. "You can't have that, that's when you say 'whoa, whoa', and I think the fourth actually registered that very quickly, you let the ref know and he pulls that back, because if that leads to them winning, that's bizarre, to allow that moment to happen. "I thought the officials were good, I know they allowed a ricochet for the corner - I think that's tough for the officials to see - maybe there were two orange cards for challenges, but overall, I thought the referee and officials were good. "But that incident can't lead to a goal, especially when it's eight yards, maybe nine further forward - that's too big a distance to allow it to go, especially when it leads to something more important." Dyche was at pains to explain he wasn't blaming Pawson, however: "I've go no angle on the fourth official at all, I think it was a natural response to catch it and out of courtesy give it back, but once it's in his hands, he runs down the pitch and puts in a throw from eight yards away...if I'm the fourth and I've been involved in that moment, even inadvertently, I'm thinking I've got to call that. "He's probably not registered how quickly it happens, but he does go through and score and that would have been really tough for us to take, if we didn't win, really hard to swallow."